It’s the end of an era for Motley Crue drummer Tommy Lee. The band wrapped their most recent tour with a gig at Trump Taj Mahal in Atlantic City on Saturday night (May 25), and the show also marked the final appearance of Lee’s unique roller coaster drum set. 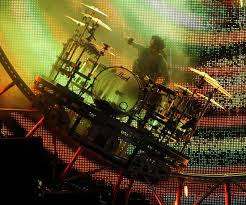 Lee’s drum solos are a big highlight of Crue’s live show, and the roller coaster rig has allowed him to take it to the next level, often performing upside down as a part of his turn in the spotlight. Bur fear not, Crue fans — it doesn’t sound like Lee is planning to sit calmly behind the drums at future shows. “Dont you all worry! Just wait til ya see what crazy I got for ya next!” he added in another Twitter post. The Crue will perform two festival shows in July before returning to Las Vegas to kick off their second residency there in September.